Welcome to TopGolfGames.com! 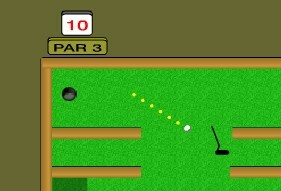 Our site features a collection of the the top Flash golfing games. Practice your skills with putting games or go for a hole-in-one with golf driving games. Golf - the anticipation, the thrill brought by every swish of the club or driver, and the unrivaled satisfaction brought by a hole in one. There's nothing quite like playing golf... that's for sure. And that's exactly what you get RIGHT here at TopGolfGames.com! You get nothing BUT the best and most popular golf games online delivered straight to your desktop. No need to buy expensive golf equipments. No need to go out of your way to experience the thrill of golfing. Heck! You don't even need to leave your pajamas. TopGolfGames.com takes care of everything for you! Whether you are looking for the best of the top golf games online, games that are so realistic that it makes you feel that you are RIGHT there at the golf course, or those that have their own unique twists, TopGolfGames.com is the RIGHT place to be. And for the seasoned gamers who love playing golfing games and posting their scores for everyone to see and bow to, NO PROBLEM! We have our global scoreboards right here that allows you to measure your skill against other enthusiasts from different parts of the world! All you have to do is register for FREE. Classic Golf Games That Have Taken The Online World By Storm! If you want nothing BUT the absolute classics in the world of online sports games, you will find it all here! Mini Putt is one of those classics - one of the beauties of Mini Putt is the game is simple, but at the same time challenging! There's nothing grand about the graphics. The controls are very easy to use and the goal of the game is simple too - finish all of the 18 holes in as few strokes as you can. If you can beat par on every hole, you are guaranteed to be in excellent shape at the end of the game! If you want an online golfing game that brings you close to reality, Superstar Golf is one of the games you should check out. And even better, we have it RIGHT HERE! Choose a golfer, grab a set of clubs, play through 9 holes of golf and have fun! Oh! And don't forget to pay attention to the details like wind direction - these details make Superstar Golf very realistic! "Who cares about clubs and wind direction? I want to have FUN with golf!" if that's your type, TopGolfGames.com has you covered! If you want nothing BUT pure fun, Platform Golf is an excellent game to get started with - one of the top 10 golf games we have here. Showcasing an 18 hole course, normal golfers have to deal with things you would NEVER see in a course. What are those? Play the game and find out! There's a golf game for everyone! Play now at TopGolfGames.com and bring out the Tiger Woods in you!